Precise simulations of the movement and behavior of crowds can be vital to the production of digital sequences or the creation of large structures for crowd management. However, the ability to quantitatively predict the collective dynamic of a group responding to external stimulations remains a largely open issue, based primarily on models in which each individual’s actions are simulated according to empirical behavioral rules. Until present, there was no experimentally tested physical model that describes the hydrodynamics of a crowd without assuming behavioral rules. Researchers from a laboratory affiliated with the CNRS, l’ENS de Lyon, and l’Université Claude Bernard Lyon 1 have provided a first equation of this type, deduced from a measurement campaign conducted on crowds numbering tens of thousands of individuals. The physicists focused on cohorts of runners at the beginning of a marathon, as they are guided to the starting line by a row of organizers in successive sequences of walking and halting. This protocol creates a periodic and controlled disturbance similar to the stimulations that are typically used to probe the mechanical response of fluids. Remarkably, group behavior varies very little from one assembly of runners to another, one race to another, and one country to another, with speed information propagating constantly at a little over 1 m/s. 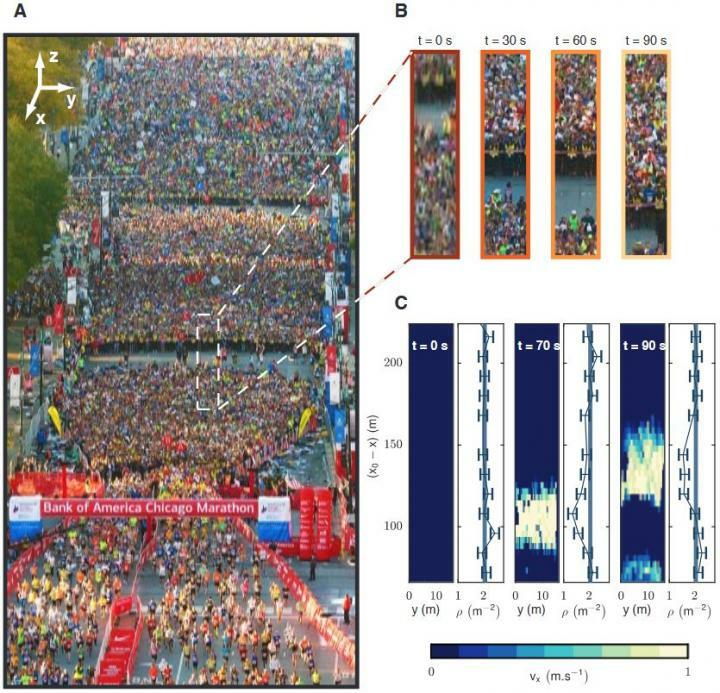 The researchers established a generic description that can precisely predict crowd flows, as flows observed in a road-race in Chicago in 2016 helped predict those of thousands of runners at the start of the Paris marathon in 2017. By using technical standards from fluid mechanics to analyze images from the starting corrals of five races, researchers successfully measured crowd speed at each instant, subsequently describing it as a liquid flow. Their results show that information regarding the speed to adopt spreads to the back of the group in the form of waves measuring hundreds of meters, with no loss of intensity. In contrast, any change to the crowd’s movement trajectory dissipates quickly, spreading just a few meters through the crowd. In short, speed information spreads easily through this fluid, while orientational information does not. The physicists now want to study the response of groups to extreme disturbances, in order to test the limits of their hydrodynamic description of crowds. * – Laboratoire de physique de l’ENS de Lyon (ENS de Lyon/CNRS/Université Claude Bernard Lyon 1).